Text: Like many other people in Britain and other countries, I went to a cinema to watch the first live transmission of a performance of a play by William Shakespeare by the Royal Shakespeare Company at their theatre in Stratford-upon-Avon. The play was Richard II. I have no intention of reviewing it. This article is about the method which was used to show it to me. Beforehand, I had reservations about this mode of seeing a play; after all, much of the point of theatre, as opposed to cinema or television, is the immediacy of being in the presence of real, live actors in the shared experience which is what theatre is all about. Conversely, much of the point of cinema is that, by using a variety of locations, sets, camera angles, and through cinematographic artistry and skilful editing, it can produce realism, escapism, and all sorts of magic in ways theatre cannot. My anxieties were that this hybrid – live actors on stage in front of a theatre audience being projected through the ether on to a distant screen – would prove to be neither fish nor fowl; that stage acting might look false ‘through the glass’; or that, on the contrary, the actors might feel forced to adapt their style to the presence of the cameras and thereby produce something unsuitable for the stage. I need not have worried. Although the frisson was inevitably somewhat diminished by not being in the actual physical proximity of the likes of David Tennant, Michael Pennington and Jane Lapotaire, this was compensated by the ability of the transmission’s director to do things such as going into close-up when appropriate, tracking slowly and dramatically in towards a key area of the stage, and following a character as he or she paced up and down. True, that took away the choice of where to look that one enjoys when in the theatre. I recall once in the National Theatre that while Oedipus was making his long, agonising speech bringing himself ever closer to the appalling truth that none of us wants him to learn, I chose to watch Jocasta’s reaction for most of the time because it was much more interesting. For a scene or two at the beginning of the experience, it concerned me that I might not be allowed that option; then I forgot about it, which suggests that a sensitive balance was being struck between showing speaker and listener when it mattered; a more difficult task in a live transmission than in a movie, where all sorts of edits may be tried before the final cut is settled upon. Besides, the ability to use close-ups was used sparingly, and for much of the time we saw much of the stage. I would still prefer to be there in person. Who wouldn’t? But we can’t always be where we want to be; and many people simply cannot afford the cost of admission and travel to such performances; so if live transmissions like this can pack ’em it at one remove, it is surely a good thing in various ways. For one thing, the economics of running theatres and theatre companies in this country are now so distorted that tickets cost too much for any but the comfortably off to attend with any frequency; however, these transmissions are cheaper to get into (although still more expensive than a film), so they may generate new audiences away from London, Stratford, and other major urban centres. 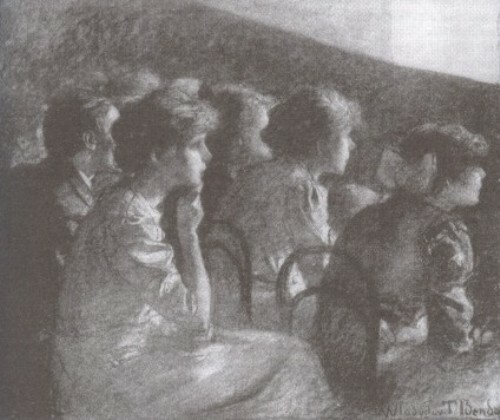 For another, the experience of attending a transmission at a cinema may encourage new audiences to move on to ‘the real thing’. There is what I would consider a missed opportunity, at least so far, in this phenomenon. The age profile of the audience in the Stevenage Cineworld was, quite simply, pretty old. Surely it would make sense to lure the young towards live theatre in general, and Shakespeare in particular, by offering them very cheap, or even free, admission? The future of the theatre in Britain lies not with audiences of old age pensioners such as myself, but with new generations fired by the excitement of live performance. If tens of thousands of them had seen ‘Dr Who’ demonstrating his true acting ability – what consequences might that have had for future audience profiles at the RSC, the National, and in our struggling provincial theatres? Comments: Albert Clack is a British actor and writer. The Royal Shakespeare Company’s production of Shakespeare’s Richard II was streamed live to cinemas on 13 November 2013. It included David Tennant as Richard II, Oliver Ford Davies as the Duke of York, Michael Pennington as John of Gaunt and Nigel Lindsay as Bolingbroke. It was the first production in the RSC Live series of live streamed plays. My thanks to Albert Clack for permission to reproduce his article here. This entry was posted in 2010s, United Kingdom, Web texts and tagged Albert Clack, Audiences, Film grammar, Richard II (2013), Stevenage, Streamed theatre. Bookmark the permalink.